A 55-year-old male patient, with a known medical history of high blood pressure, suffered a head injury in September 2016 for which a cranial non-contrast CT (NCCT) was done. An AcomA aneurysm was found incidentally. A cranial non-contrast CT (NCCT) revealed a hyperdense mass in the suprasellar cistern. A subsequent MRI examination showed an AcomA aneurysm without evidence of subarachnoid hemorrhage. DSA was performed showing an irregularly shaped wide-necked AcomA aneurysm without dominant blood flow through either of the two anterior cerebral arteries. The neck width was 6 mm; the fundus height was 4.5 mm, and the fundus width was 5.5 mm (Fig. 1). The goal of the endovascular treatment was to prevent a future subarachnoid hemorrhage due to the rupture of the AcomA aneurysm. The technical consideration had to take into account the wide neck of the aneurysm, the equal vessel diameters of both afferent A1 and efferent A2 segments, and the relatively shallow aneurysm fundus. The treatment strategy was focused on achieving aneurysm occlusion with coils. The short aneurysm fundus was an argument against the usage of a pCONus. Stent reconstruction of the AcomA, however, was needed since the neck of the aneurysm involved the complete AcomA. Reconstruction of the neck with two crossing stents in “X” configuration was chosen, followed by a stent-assisted coil occlusion. Course of treatment: the left internal carotid artery was catheterized with a triaxial catheter system. Via an 8F Shuttle catheter and an intermediate Navien A+ 072 catheter, an Excelsior SL10 microcatheter was navigated over a Transend 0.014″ microguidewire through the left A1 to the right A2 segment. The LVIS Jr. 2.5/23 mm was deployed from the right A2 segment to the left A1 segment. After the deployment of the first stent, the right internal carotid artery was catheterized with the same triaxial catheter system, composed of a 8F Shuttle catheter, an intermediate Navien A+ 072 catheter, and an Excelsior SL10 microcatheter, which was again navigated over a Transend 0.014″ microguidewire through the right A1 to the left A2 segment. 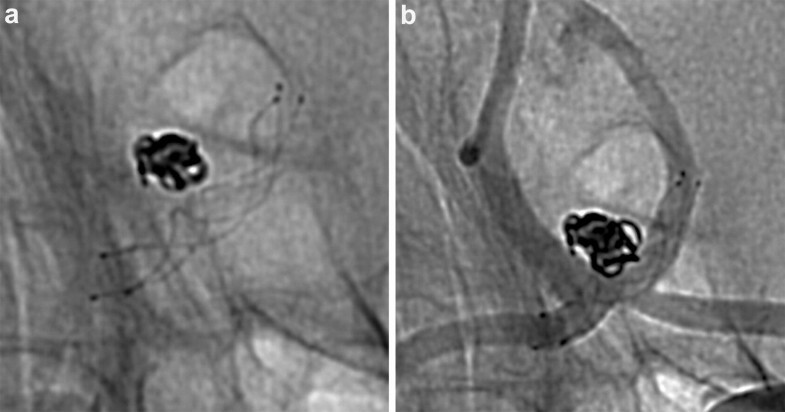 The second LVIS Jr. 2.5/23 mm stent was deployed from the left A2 segment to the right A1 segment crossing the first LVIS Jr. After the deployment of the second stent, several attempts to catheterize the aneurysm sac were carried out through the right ACA. Catheter access to the aneurysm fundus through the crossing stents was not possible from the right-hand side. The triaxial system was withdrawn from the right and inserted into the left ICA. 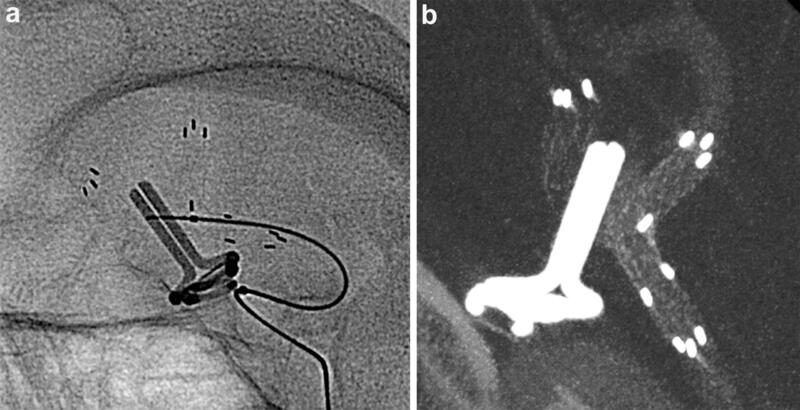 The Excelsior SL 10 was placed inside the aneurysm sac, and complete stent-assisted coil occlusion was achieved (Fig. 2). The procedure was well tolerated; no complications were encountered during the first 24 h after the procedure. The patient was discharged home 2 days after the procedure. A brain MRI/MRA performed 6 months after the procedure showed no evidence of ischemic or hemorrhagic complications, patency of both ACAs, and complete occlusion of the AcomA aneurysm. The AcomA was not seen due to susceptibly artifacts. The patient remained in a condition equivalent to modified Rankin Scale (mRS) 0. A control DSA performed 1 year after the procedure showed complete occlusion of the aneurysm. No in-stent stenosis was observed (Fig. 3). The incidence of intracranial aneurysms is in the range 1–6% of the population (Wiebers et al. 2003), and about 90% of all aneurysms are located in the anterior circulation. 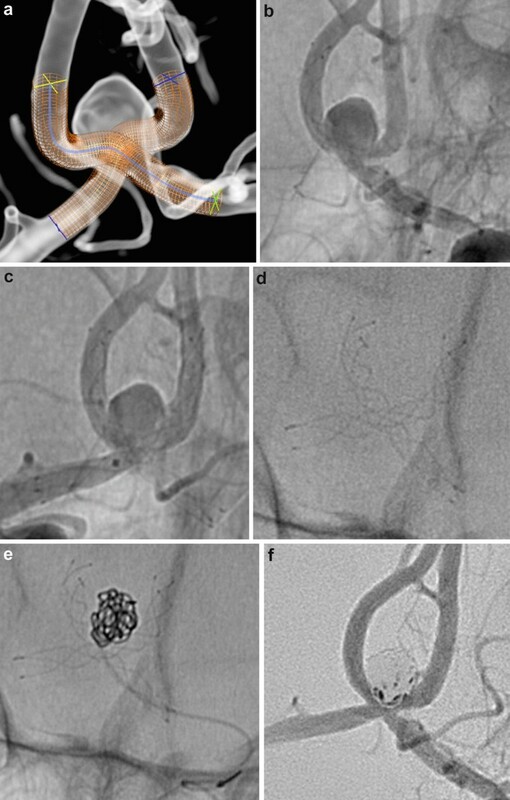 About 40% of all the ruptured intracranial aneurysms are located at the AcomA (Gonzalez et al. 2008). 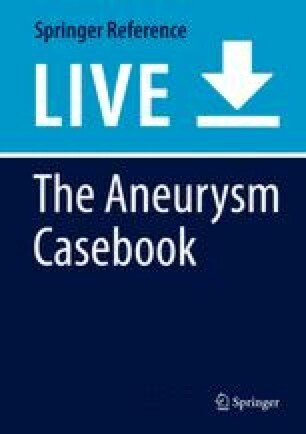 When treating AcomA aneurysms, we have to take into account complex anatomical features like the orientation and the size of the dome (e.g., posterior-directed aneurysms have a higher recanalization rate than those with an anterior dome direction), the agenesis or hypoplasia of one A1 segment, and the size of the aneurysm neck. These factors are related to the success of an attempted complete initial occlusion, the encountered technical difficulty during the coil occlusion, and the long-term occlusion stability (Gonzalez et al. 2008). The most important limiting factor for the endovascular treatment is the size of the aneurysm neck (Viñuela et al. 1997). The use of a straight coil occlusion technique in wide-necked aneurysm may lead to an incomplete initial occlusion and intraprocedural complications like protrusion of the coils into the parent artery, resulting in thrombosis and occlusion of the parent vessel (Piotin and Blanc 2014). 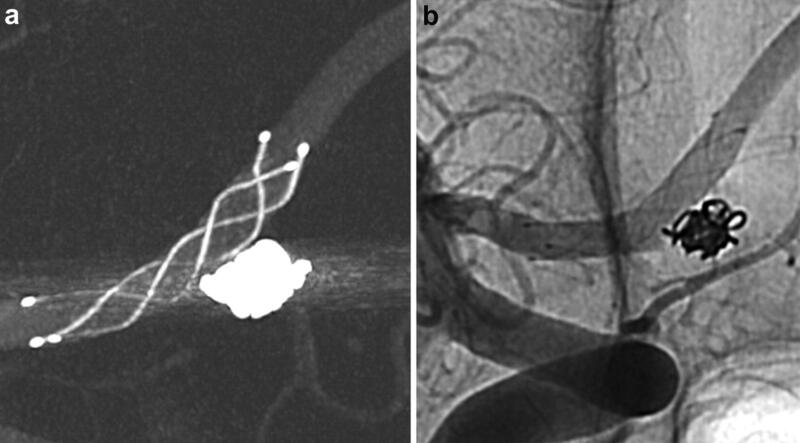 Higashida described the stent-assisted coil technique in 1997 on the basis of a basilar fusiform aneurysm (Higashida et al. 1997). With stent-assisted coiling, higher rates of initial complete occlusion can be achieved. The stent allows for an increased coil packing density with more coverage of the aneurysmal neck (Bendok et al. 2007). The rate of recanalization is decreased due to the hemodynamic changes that redirect blood flow away from the aneurysm sac by decreasing the blood flow velocity (about 40–60%) and changing the structure of the blood flow (Tateshima et al. 2009). The endovascular reconstruction of the neck is necessary to achieve complete and permanent coil occlusion. A larger size of the aneurysm neck has been related to higher recanalization rates (Gonzalez et al. 2008), and stent-assisted coil occlusion has been reported as a safe method with low mortality and morbidity rates in order to achieve this (Kocur et al. 2016). The most frequent causes of morbidity and mortality in stent-assisted coil occlusion are thromboembolic complications. Their published frequency ranges from 4.2% to 17.1% (Gao et al. 2011). This complication can be avoided if adequate inhibition of platelet function is achieved. The initiation of this medication several days prior to the stent implantation procedure is recommended. The efficacy of all available drugs shows a major variation between individuals, ranging from non-responding to serious hyper-response. There is an ongoing controversy between clinicians concerning the benefits of response testing. We confirm the efficacious inhibition of the thrombocyte function in all patients prior to any stent deployment with the VerifyNow test (Accriva). The stent placement in AcomA aneurysms can be done in different ways. The device can be deployed from one A2 segment to the ipsilateral A1 segment (half H, Fig. 4) or on both sides (H configuration). Deployment is also possible from one A1 segment to the contralateral A1 segment (the least used configuration) and from the A2 segment of one side to the contralateral A1 segment covering the aneurysm neck (half X, Fig. 5). If one stent is not sufficient to achieve adequate coverage of the aneurysm neck, a second crossing stent must be deployed (X configuration). In patients with hypoplasia or aplasia of the A1 on one side, a Y-stent placement can be carried out by deploying two stents, one in each A2 segment and both proximal stent segments in the same A1 segment. The proximal stent ends can be deployed one inside the other (“crossing,” Fig. 6) or in parallel (“kissing,” Fig. 7). In patients with both A1 segments of sufficient diameter and a wide-necked aneurysm involving both A1-A2 junctions, the X-stent placement is preferred. This concerns the deployment of a stent from one A2 segment to the contralateral A1 segment and a second stent from the contralateral A2 segment crossing through the first stent to the concerning A1 segment, in order to secure adequate coverage of the aneurysm neck and protection of both A2s during coil occlusion (Saatci et al. 2011). The microcatheter used to deliver the coils could be placed inside the aneurysm prior the deployment of the stent(s), known as “jailing technique,” or placed after the deployment of the stent by passing through the stent struts, known as trans-cell technique (Kocur et al. 2016). Catheterizing through the stent struts can be difficult, especially in the closed-cell design stents (Maldonado et al. 2011). Another factor to consider is the selection of the stent design, closed or open cells. In a report by Thorell et al. 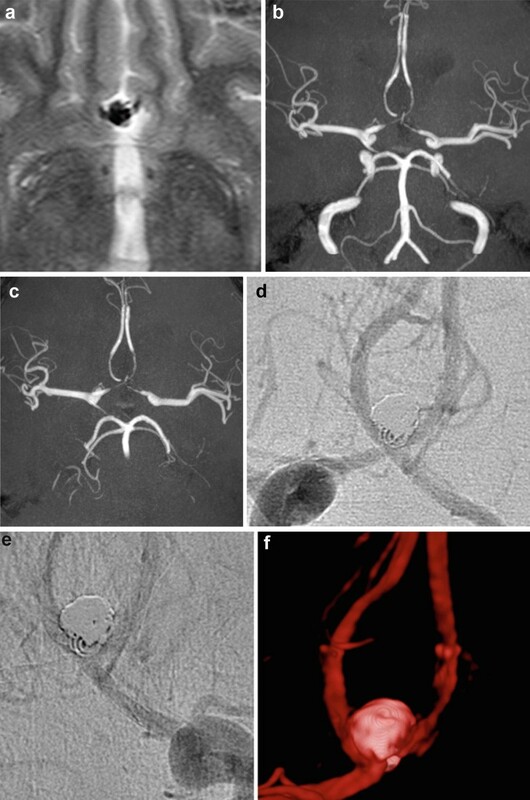 (2005), a total of seven basilar bifurcation aneurysms were treated with Y-configuration stent-assisted coil occlusion with Neuroform stents (then Boston Scientific, now Stryker). 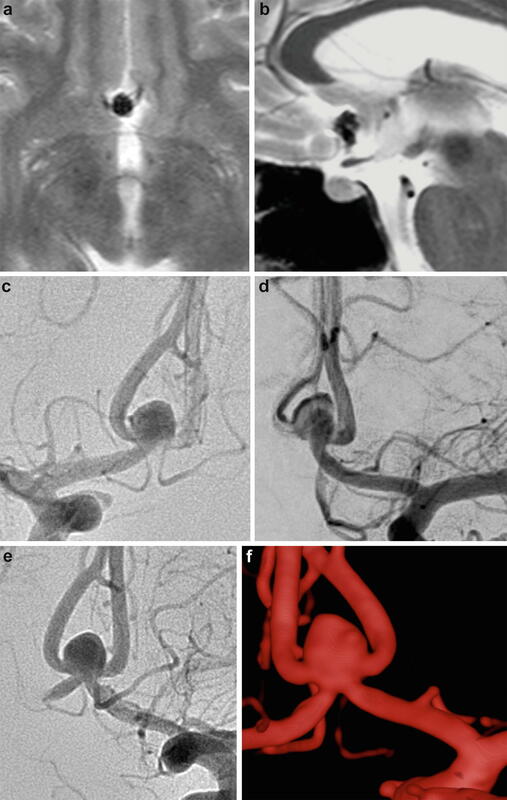 Two of these seven aneurysms showed a recanalization during follow-up despite an initially successful coil occlusion. According to Saatci et al. (2011), the recanalization rate of these aneurysms can be explained by the open cell configuration of the stents, and they speculated that the use of closed-cell stents to create a flow diversion effect in the crossing point of the stent might be advantageous. The use of X-stent- or Y-stent-assisted coil occlusion yields a higher rate of delayed aneurysm occlusion than in aneurysms coiled without the use of a stent (Piotin et al. 2010). In a series published by Johnson et al. (2013), a total of 17 out of 27 aneurysms (63%) presented with delayed aneurysm occlusion after 6-month follow-up despite incomplete initial occlusion. The possibility of secondary aneurysm thrombosis should be kept in mind in the case of incomplete coil occlusion and anticipated risks of the attempt to insert additional coils (Kocur et al. 2016). A rare but important complication of stent-assisted coil occlusion is the in-stent stenosis with potential clinical manifestations. Some of these in-stent stenoses will resolve spontaneously if there is continued dual inhibition of platelet function. High-grade (>80% lumen loss), progressive, and symptomatic in-stent stenosis may require balloon angioplasty (Fiorella et al. 2006), which will present significant technical challenges in the context of crossing stents. In summary, X-stent-assisted coil occlusion is a safe and relatively straightforward technical option for the treatment of unruptured wide-necked AcomA aneurysms if bilateral A1 segments with sufficient diameter are present.